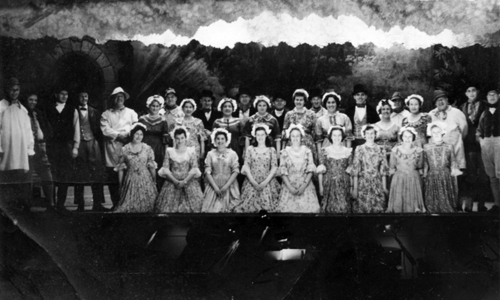 With plenty of choral singing, the Gilbert and Sullivan comic operas were favourites with Cromer and Sheringham Amateur Operatic and Dramatic Society through the 1950s. The dramatic impact of the Sorcerer depended on an exploding teapot or kettle, which from recollection was not entirely reliable in the production. After the Second World War the Operatic and Dramatic Society started again, combining the singing and acting talent of the two towns. There were some early productions at the Town Hall at Cromer whilst it continued as a theatre but it was not long before the Pier Pavilion became the favoured venue. After the damage to the pier by the 1953 floods, productions had to be at the Town Hall until the pier was fully repaired. The big change came in 1961 when a non G and S production was put on for the first time. Dvorak's 'Summer Song' was the choice, built loosely around his life with its melodies from his 'New World' symphony. From then onwards, the Society would not return to the G and S selection; the Sheringham Savoyards were started up to serve those who wished to maintain that tradiiton.